The vast terrain stretching from the Great Lakes to the Gulf of Mexico and from the Mississippi Valley to the Atlantic seaboard is dotted with thousands of ancient man-made earthen and shell mounds and embankments. More than five thousand mounds have been recorded outside of the Mississippi Valley, among them a few in coastal Labrador and the Desert Southwest. Some mounds are taller than oaks, while others are barely waist high. There are domes, cones, flat-topped platforms, other geometric forms, and animal effigies as well as raised rings, spans, and facades. Many were built in a single stage, but larger mounds were often capped or mantled several times. Some mounds are devoid of artifacts and interior features, others cover dismantled wooden buildings, and still others contain burials or form foundations for walled buildings. Embankments encircle plazas or connect buildings in cosmic or magical arrangements. Sometimes there is only one mound; sometimes there are a score or more. Invested labor ranges from modest (the equivalent of a mere handful of people working for a day or two) to monumental (the equivalent of hundreds of people toiling for years). So who built these mounds? Ignoring more than a century of eyewitness accounts, some nineteenth-century antiquarians refused to admit that the mounds were the work of the American Indians, claiming instead that the architects were refugees from sunken continents, lost races, conquering foreign legions, or the mighty Aztec or Toltec. These perceptions lasted until 1894, when the Smithsonian Institution’s thirteen-year mound study definitively showed that Native Americans were the builders. With the identity of the Mound Builders resolved, twentieth-century archaeologists turned to the history of mound building. Boosted by radiocarbon dating in midcentury, archaeologists have traced Mound Builder roots back at least seven millennia. The oldest known mound group in mainland North America is Monte Sano on the banks of the Mississippi River in what is now Louisiana. The larger of its two conical mounds covers a crematorium and dates to sometime around 7,300–7,400 years ago (calibrated). Early mound building flourished between 5,000 and 6,000 years ago, when Lower Mississippi Valley natives erected solitary mounds as well as mound complexes with between two and eleven structures. Early mounds were empty but were occasionally built over demolished wooden structures. Denton is the oldest known mound complex in Mississippi, dating to around 6,200–6,300 years ago. South Atlantic coastal groups continued to build shell mounds and rings through the ensuing millennium, but the falling population in the Lower Mississippi Valley quieted mound building. It resumed in grand fashion around 3,700 years ago, when a giant earthwork incorporating nearly a million cubic yards of dirt was erected at Poverty Point in northeastern Louisiana. 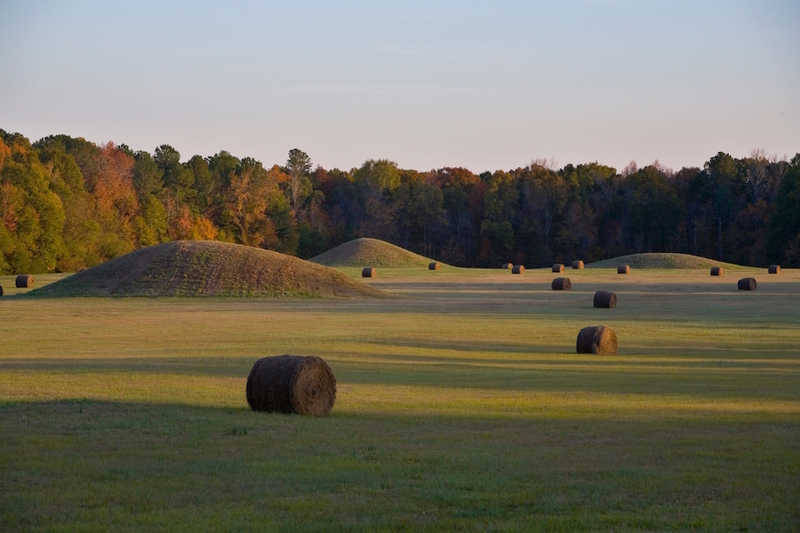 Another population decline followed Poverty Point’s abandonment, and when mound building returned some six centuries later, small domed mounds had begun to assume burial duty. A few hundred years later, around the turn of the Christian era, they often became lavishly appointed conical tombs that incorporated homespun mortuaries with grave goods fashioned in international Hopewell style. Later, the Lower Mississippi population plummeted again, and when mound building recommenced a few centuries later, mound form and function changed—flat-topped platforms, often true truncated pyramids, supported temples and elite residences—but a few mounds continued to be used for burial. Large earthwork towns came and went as the winds of war and local politics dictated: Cahokia in Illinois; Moundville in Alabama; Troyville, Pritchard Landing, and Mott in Louisiana; and Toltec and Lakeport in Arkansas. Two of the most important mound sites in Mississippi are Lake George and Winterville. The first is located on the south side of Lake George, a half mile east of the Sunflower River and southeast of what is now Holly Bluff. Archaeologists recognized twenty-five mounds there, ranging from gentle rises that were likely house foundations to a fifty-five-foot high mound that covered almost two acres. The other large mounds at the site served as ceremonial centers. An earthen wall and a trench surround the site. The location was a fortunate one for the Mound Builders, with fertile Delta soils and wetlands supporting food supplies, primal hardwood forests providing resources for the shelter, streams and rivers containing fish and shellfish, and natural levees from Mississippi River sandy and silty loams protecting the site from flooding. The Winterville site, near the present city of Greenville, has at least twenty-three mounds and several plazas. Like other Mississippian societies, the people at Winterville had a well-defined social hierarchy based on heredity through the female line and expressed at the top through affiliation with a powerful chief. A fire in the late fourteenth century destroyed the original structure at Winterville, and the population declined thereafter, moving to other locations in the Yazoo River Basin. The powerful Natchez tribe was among the last of the Mound Builders, but its unity was destroyed in a prolonged war with the French in 1731. The Mound Builders were not a single tribe but comprised many independent groups that built mounds as a traditional way of celebrating the creation and the cosmos. Natives called mounds navels, the mini mountains where first humans rose from their watery birth cave deep in the earth, and many of the multiple-mound complexes, especially the older ones, employ standard measures and mound placement to portray the cyclical march of the sun, moon, and Venus across the sky. Mound arrangements thus not only diagram the tiered cosmos but accurately measure the day counts of the heavenly cycles: they are native North America’s first calendar, predating similar Mesoamerican almanacs by centuries. Mound form and use changed over the seven-millennium history of mound building, but Mound Builders remained true to the ancient core beliefs until the last basketload of earth was tamped into place.